Web GIS helps track the progress of citywide solar installations. Solar radiation tools in ArcGIS Spatial Analyst calculate the solar energy potential of building rooftops. The ArcGIS API for Flex wraps the application in a user-friendly format. In 2007, Boston mayor Thomas Menino issued an executive order on climate change that set greenhouse gas reduction goals and outlined city strategies for recycling and renewable energy. That order was decisive in the formation of Solar Boston, a two-year $550,000 project designed to expand the use of solar power throughout the city. Solar Boston is part of the Solar America Initiative, a campaign launched by the U.S. Department of Energy (DOE), to make solar electricity cost-competitive with traditional electricity production by 2015. To help meet the city's greenhouse gas reduction targets and support the goals of DOE, Mayor Menino set a target of 25 megawatts of solar power installed by 2015. To support the Solar Boston program, Boston is using Web GIS technology to map current solar installations, track progress toward the mayor's goal, and allow Bostonians to analyze their rooftop solar energy potential. The ArcGIS Solar Radiation tool gives users the ability to research solar power capacity. Solar Boston builds on the City of Boston's leadership in promoting green buildings. Green building is the practice of maximizing the use of a building's resources while reducing the environmental impact throughout its life cycle. In 2004, Mayor Menino created a Green Building Task Force, and in 2007, based on the task force's recommendations, Boston became the first major city in the United States to require all large, private-sector buildings to conform to the Leadership in Energy and Environmental Design (LEED) green building standards. Outfitting Boston's largest residential and corporate structures with solar panels is in keeping with the city's green building and energy conservation objectives. Renewable energy is a solution for reducing the demand on and air pollution from traditional energy systems. As on-site sources of clean power, solar energy systems can reduce greenhouse gas emissions and air pollution, increasing energy security and creating local jobs. Solar electricity systems (also called photovoltaics [PV]) also have the potential to generate power when it is needed moston hot summer daysthereby relieving strain on the electricity system and reducing the risk of blackouts. By encouraging solar energy, Boston hopes to not only capture these benefits but also prepare for the market explosion likely to occur when solar power becomes competitive with fossil fuels. To promote the use of PV to investors, the Boston Redevelopment Authority (BRA) needed a system to showcase solar energy potential in a user-friendly formatone that lets users investigate locations of interest and perform preprocessed analysis. GIS was the obvious tool to achieve this end because it started with a visual referencea map of the entire city showing the buildings that had solar installation potential. Says Wilson Rickerson, Solar Boston coordinator, "We needed a baseline, because you can't really get anywhere if you don't know where you are. Without GIS, we'd have no concept of the size of the city's solar industry, how fast had it grown, and what potential it had." GIS analysts at BRA started on the project by using ArcGIS Desktop software's ArcGIS Spatial Analyst extension to calculate the solar radiation available on building rooftops. To do this, they built a digital elevation model (DEM) of the city. "We took the bare earth DEM and 'burned' into that the building heights using attributes available in the building footprints, which resulted in a three-dimensional surface model of the city," says Greg Knight, senior GIS applications developer with the Boston Redevelopment Authority. "We proceeded with this prepared surface and utilized the solar radiation tools available in Spatial Analyst to calculate what the solar radiation availability would be for each rooftop." The solar radiation tools allowed the analysts to model incoming solar radiation and take into account numerous factors, including variation in elevation, orientation (slope and aspect), the shadows cast by topographic features, and changes with time of day or year. 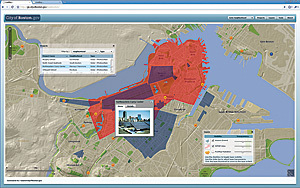 After completing the analysis in ArcGIS Desktop, the solar radiation map was published, along with a basemap, other layers of interest (e.g., historic and local electric utility districts), an address locator, and geoprocessing tools, to ArcGIS Server for use by the Solar Boston Web application. "The application was originally built using a geoprocessing service, which calculated the solar radiation on the fly," continues Knight. "Because the calculations took about 30 seconds to complete, we preprocessed the analysis in order to deliver a more responsive Web application." 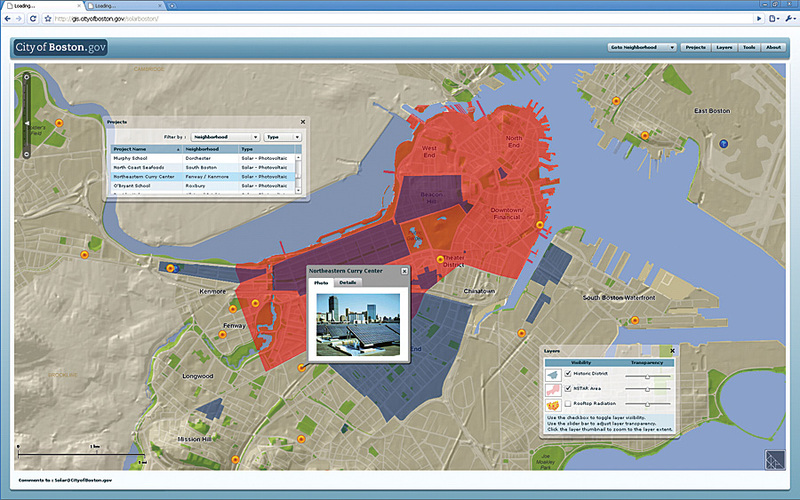 Wrapping the analytics in an easy-to-use Web GIS application was the next step. GIS developers at BRA saw great potential in Esri's new ArcGIS API for Flex, which is a client-side technology rendered by Flash Player 9 or Adobe AIR. Flex gives developers the capability to combine GIS-based Web services from ArcGIS Server with other Web content and display it in a fast, visually rich mapping application that can be deployed over the Web or to the desktop. It was the ideal medium to show investors the logistics of solar energy investment. "We gathered market data to get a baseline, but we knew it was equally important to publicize the information via the Web," says Bradford Swing, director of energy policy for Boston. "We knew Solar Boston needed a map, and this map is a simple, powerful tool to chart what we've accomplished and where we want it to go in the future." Thanks to Boston Solar's Web application, Boston's real estate sector can easily start learning about the feasibility of its solar projects. For more information, contact Greg Knight, senior GIS applications developer, BRA (e-mail: gregory.knight.bra@cityofboston.gov); Wilson Rickerson, Solar Boston coordinator (e-mail: wilson@rickersonenergy.com); or Bradford Swing, director of energy policy for Boston (e-mail: brad.swing@cityofboston.gov). See Solar Boston's Web GIS in action at gis.cityofboston.gov/solarboston.